You are here: Home / Website / What is local SEO? Local SEO is an optimisation process to list local businesses with either a physical address or deliver and serve to their customers locally. Google Maps will list local business who have verified their business but with ongoing local SEO optimisation you too can see your business on the first page of Google. Why it’s important to be seen on Google Maps? It’s important for all local businesses to be seen in Google Maps because you want potential customers or people who know your business to see your contact details due to they don’t know your phone number of by heart. Your business listing on Google Maps will be able to tell your customers your hours of operation, see your news and events and even post amazing review. 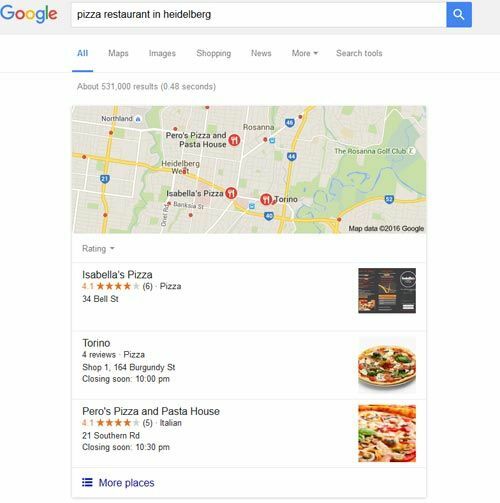 But most importantly most people search for generic terms such as “pizza restaurant in Heidelberg” because they don’t know your business. You want to be seen straight away to get better results locally for your business. What can I do to list my business on Google Maps? To list your business in Google Maps you first must have a physical address, that’s right. This is a part of Google process to verified real businesses before enlisting it on Google Maps. It’s recommended that your website should list your business address on every at either the top or footer section. This will help Google to clarify and connect the website and your Google Maps listing together. This is just a few things you can get your business be on top of the list. Good luck with your search to be seen on Google Maps, if you need help to listing your business on Google please don’t hesitate to contact us. https://www.neptunedesign.com.au/wp-content/uploads/2016/03/local-search-engine-optimisation.jpg 347 516 neptunewebdesign https://www.neptunedesign.com.au/wp-content/uploads/2019/04/Von-Agency.png neptunewebdesign2016-03-19 10:59:282016-03-19 11:21:27What is local SEO?